Showing horses in the Western division can be great fun and very satisfying. It can also be extremely expensive. 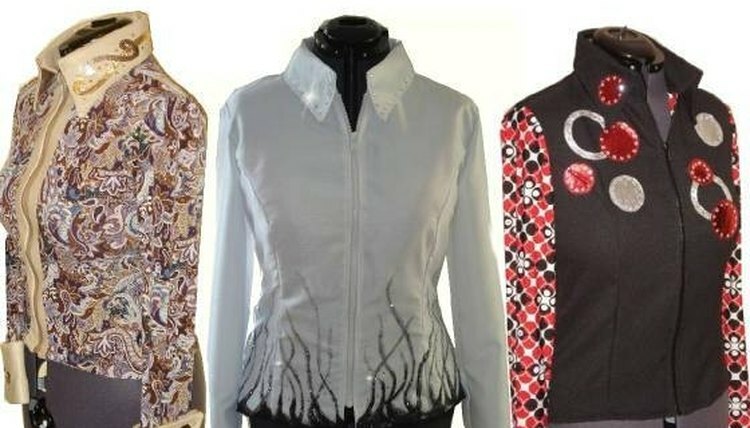 Not only do you spend a small fortune on the tack used for your horse, but you will spend almost as much on your own clothes for the show ring. You can save an amazing amount of money by learning how to create your own Western show clothes. This article will give you some tips, and some links, to help you learn to make your own Western show clothes. Begin by choosing a pattern. Links to some places to buy patterns online are in the resources section. Make sure you choose a modern pattern that is trendy right now. You can do this by studying Western Horse magazines and seeing what the winners are wearing. Design your outfit. This needs to be done with great attention to detail, and done with tailored measurements from your own body. You will need to know what kind of material you want, what color patterns, what decorations, buttons, and any and all other details of the outfit before you begin. Adequate preparation is one of the most important steps. Purchase your materials. This can be done at any fabric store. Keep in mind most Western show clothes will require some Lycra, as most of the clothes are quite form-fitting, so two and even three way stretch will be needed. Cut and sew your material to the pattern you have purchased. Make sure when you cut your material to cut too much rather than too little. You can always trim excess, but cannot add material if you cut it too short. Use your sewing machine to make the stitches as neat and as invisible as possible. Try on your clothes before you begin the decoration process. It is important that you have a good fit and can move comfortably before you make the final adjustments to your clothes and make them show ready. Take your time and consult with a tailor the first time you attempt this. Making clothes is an art, but with time and patience, almost anyone can learn to make attractive clothes - saving yourself a ton of time and money! Never attempt to create Western show clothes without help the first time. It is too tricky!